Last two days I wasn;t feeling a 100%, had a bit of trouble with my epilepsie, but I am used to it. I just hate it, because I am not in the mood to do a lot of things, I know it is better to stay calm and wait till it is over again. I think today it is gone again, so I can go out and do my shopping necessary. Also can take my papers needed for the taxes and copy them and I can send them all to the accountant. Glad when that is done. Then have to get all papers together for the reduction of city council taxes, and hopefully it will be worth all the trouble. Couldn;t go to the doctor with Jan, because when I called for an appointment we got a tape with the message he is on holiday till the 1st of March, damn! We could go to his replacement, but I think it is better to wait and go to our doctor, he has all information about Jan and his medication and such. So the poor soul has to live on with his bad back a couple of days more. 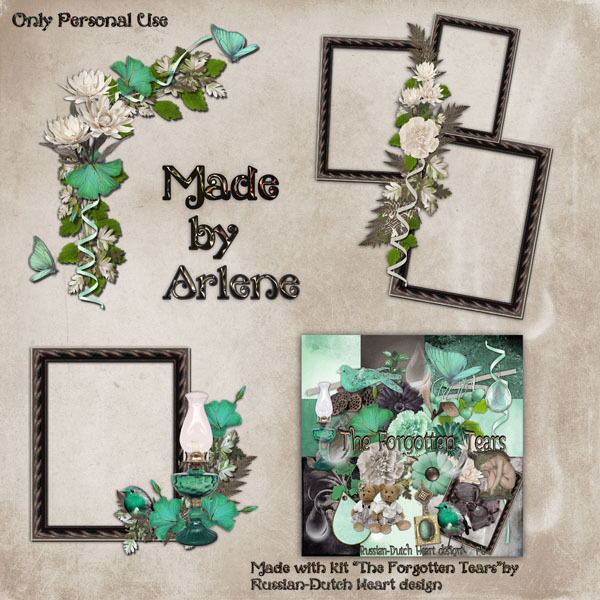 I received new clusters from Arlene, but I didn;t have time yet to make previews and upload them, so we will do with a kit and clusters I still have "in stock". 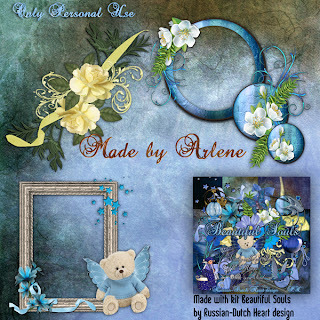 By the way, Linda made another awesome quickpage, and if you want to see a gorgeous bloglayout she has made you'll have to go to Mat's blog. Have to get some clothes on now and get moving, besides the copy thing and shopping the house could do with some attention too LOL! 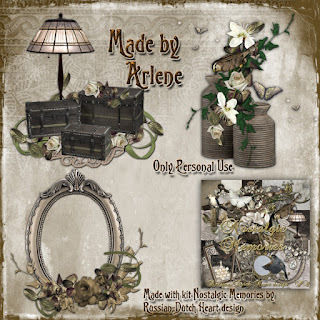 Here you have "Glimpses of a Life", with clusters of Arlene, with a special one in it. There are strange creatures in nature! 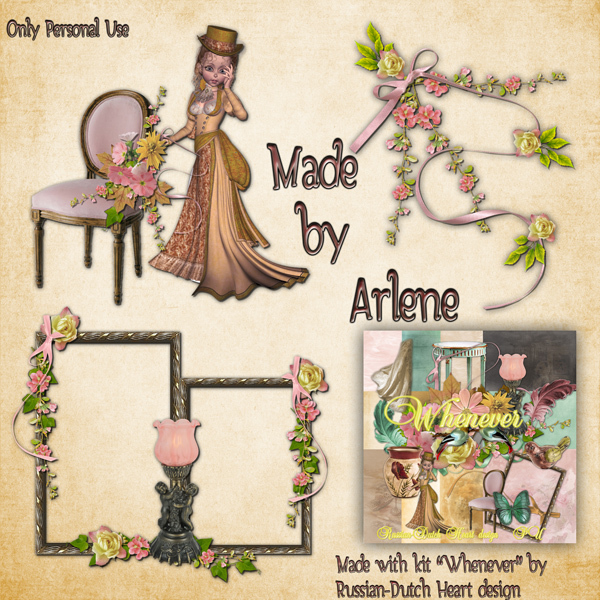 It was a nice weekend, quiet as I like it, saw a lot of tv and also did some designing. Yesterday we watched a program Jan took on DVD, it was a nature program with David Attenborough, I love that man, he can tell so passionate about nature and it's creatures. The program yesterday was "Attenborough's Ark of Noah". He picked 10 animals who are endangered species, which as he told, was an almost impossible task, because there are lots more, but he chose some very interesting ones. I tried to ding something about it and I did even find this particular one I saw. I will give you the link and if you have time, it's a wonderful video on you tube. Good thing is also to know, that there are people who want to help those animals in survival and support special projects for breeding which might prevent extinction of those beautiful creatures. My chili con carne was a success, LOL. It isn't so difficult to make, but I always try to give a recipee a bit of personal touch, and like to use as much of fresh ingredients as possible. I have more than enough for today too and I think I will put a part of it in a little box to put it in the freezer for later. Yesterday I made some rice with it, today I think I will cook some potatoes, or may be I'll make potatoe mesh of them, don;t know yet. This week I will have to dive into some papers and copy them, because ;ast year we didn;t earn very much money, so it might be the case that we can a[pply for reduction or even more of some taxes. I understand they want some evidence of your income, but I saw the list of papers you will have to add at the appplication and it's a very long list! I hope i can find all the necessary stuff. Perhaps it will be worth all that trouble. Hate a bit all that paperwork, but I must give myself a kick in the bottom, and do it, cause it can save us several hundreds of euros. We'll see if that happens, because we often are just that lucky people who just don't meet all the necessary conditions, it stucks on just a tiny little thing most of the time LOL. 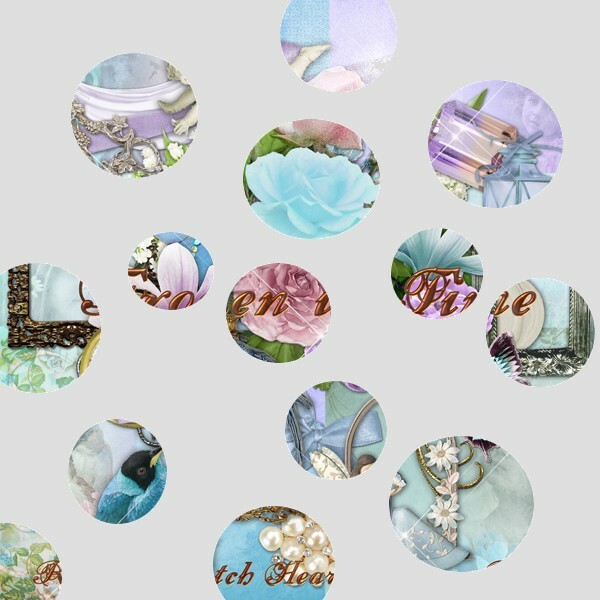 I have a sneak peek for you of my last finished kit, which will be posted somewhere next month. Any idea what kit this is? I had really great fun making this one, all came out the way I wanted. 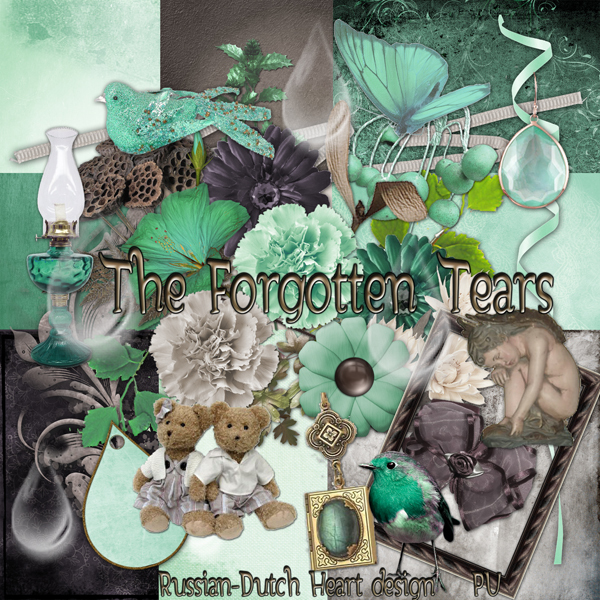 Okay on to the freebie for today, "The Forgotten Tears", and clusters from Arlene. Rather good weather here, again sunshine, temps not really high, but nice. I was out yesterday for a moment and also on Monday and it was nice. You can feel a bit the warmth of the sun at times. Oh how wonderful, it means that sunny times are slowly coming a bit nearer, and may be Spring will not wait too long to arrive( we have just hope LOL). Even Jan went out for a walk again. Well, he had to yesterday to give a blood sample again, but even on Monday he made a little walk. Not that all is well again with his back, but it seems it's better for longer periods now. Still has to be and move very careful, tried to get him to the doctor again, but no success. I gave up, yes, I did. Just have to watch him, and hoping he gives some answers when I ask him how it feels. He always answers with"oh, it's going wonderful". Great help, hey? But he is also a brave guy, not complaining or moaning, amazing. and her blogpost did bring me back memoreis about my first steps in the digital scrapbooking and later the first steps on designing. Oh my God, my first attempts looked aweful! Go to her blog and read the post and I am sure many of you will understand what I mean. 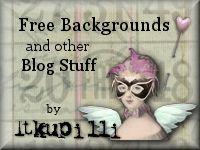 And if you are there you also can grab some awesome freebies, and she also has a page where she gives you links to all sorts of recources which can be very useful. 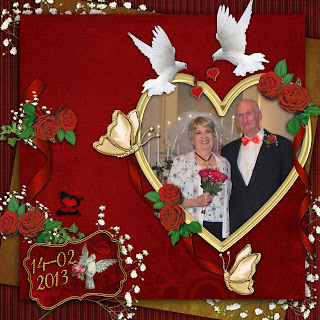 Last week the mother of one of my internet friends, Valinda, married on Valentines day. Valinda already did post a few photos of the ceremony and I snatched on to make a layout for her and her mother as a kind of little wedding present. She posted it on her blog, but I will show it here too. 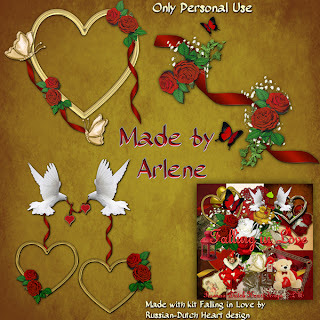 I;ve made the layout with my kit Falling in love(clusters used from Arlene). The couple is looking so happy and young amazing to know they are 83 and 81 years old! I sure hope I will reach that age and then will look THAT GOOD! Did already the laundry and some ironing yesterday, so perhaps I can leave the house for a day, want to prepare the dinner for this evening a bit earlier, meat has to be on the stove for a while and I'll make a stew to go with it from mashed potatoes and sauerkraut. There will be enough for two days in a row, so tomorrow is easy on the cooking LOL. And it alwasy tastes better the second day. But when all is clooking and such, I might take that time to run around with the vacuum cleaner( not just running,but actually using it , hahahaha), because with the sun shining into the room it shows a messy floor! 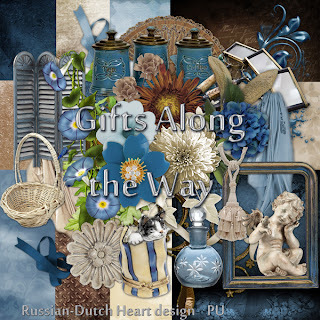 Today;'s kit is "Gifts Along the Way", with clusters from Arlene, as usual. I think this is again a versatile kit, so have some fun with it. Yes, we had at the same time a lazy and also busy weekend. How come? well, there were the World championnships speedskating for allrounders this weekend. I almost forgot about it. Good that Jan remembered! As you know I am a fan of watching this sport, you can imagine that we were busy doing nothing else than watching the event. It's a loooong seat, two days, all afternoon, but it's great. And it was worthwhile, because I can brag now LOL. 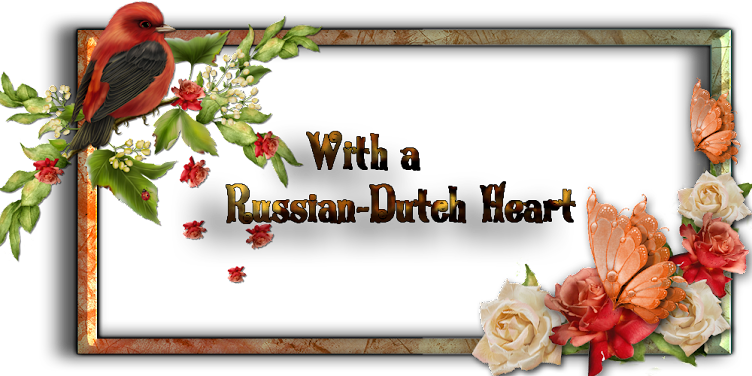 We have 2 Dutch world champions, one with the ladies and one with the men, and with the ladies even the second place too!. So I had some plans for the weekend, but they didnlt work out because of the event. Friday I did some stuff in the house, so that was a good thing. 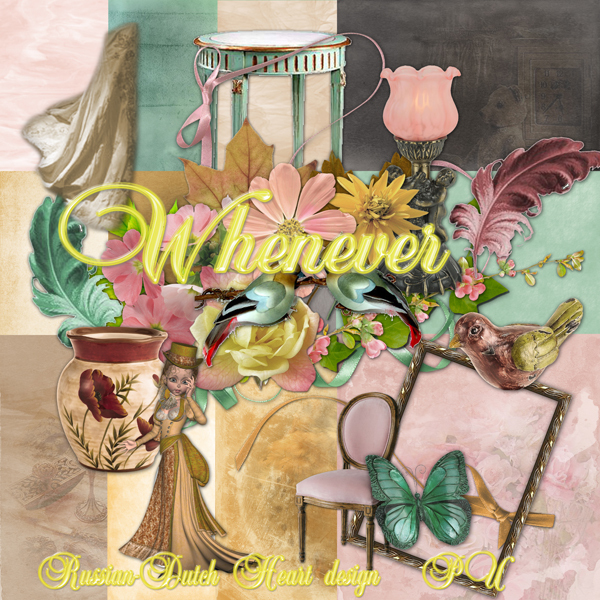 And in the mornings on Saturday and Sunday I even did some designing. Also had to make a couple of previews for clusters Arlene made, have to make one or two more, and then figure out a new kit. Well, most of the times it is best to just find a colour pallette and then just start, and during the "proces"the idea grows for the kind of kit. In earlier days I worked more with a theme in mind, which is necessary sometimes, but it's also surprising and fun to see what comes out of the blue. For the moment that works best for me. I sometimes even have already a name for a kit and work it out from that. With the "crisis"going around almost all the world, lots of debats are started again about the salary and bonusses that are given to bank directors/managers, or directors/managers of other businesses. This morning I read on teletext that a director of a firm in Switzerland was leaving and will have a leaving-bonus of.58 Million Euro! Can you imagine the amount of money that is? Of course he said that a large part of it will be given to charity and such, what a nice gesture !! He received a salary in the 11 years he was there of about 240 million euros. I think he worked with a pharmaceutical company. Well, he only had to promise he wouldn;t work for another company like that the coming 5 years. Why bother????? He doesn;t have to work anymore at all, he just could take some job he likes as a hobby ROFL! I don;t think that are normal amounts of money anymore. Take away those insane bonusses from several big guys and I think a lot of countries could repaire their budget deficit easy without having to cut back on social health, house building, raise rents, business taxes for small businesses, raise taxes for the citizens, cutting back on the pensions for the elderly etc. May be a naive thought, but it surely could help already a lot, with probably the result that people would get a bit more confidence in the economy again, would be able to spend a bit of money again, which is good for businesses again etc. Good, I got of the steam again, hahaha, better to forget about the whole thing, because I cannot do anything about it, which is a pity, but reality. To start off the week I have a nice kit for you, "Tranquil Moments". 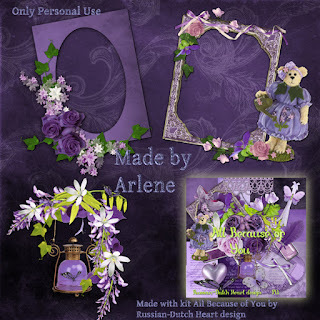 Great clusters from Arlene, so hopefully you can do some lovely things with the kit. Hope there will be no more snow.! Gosh, how brave I was yesterday! It did start to snow a bit on Wednesday, but it was just a thin cover. Still it was around yesterday, and it started raining a little bit. Nothing special, but it was a bit tricky, cause the ground still was very cold, so the rain freezed. All together it made my shopping tour somewhat slippery. I waslucky that the most of the way I could walk on : dry"parts of the sidewalks, just had to be careful when rossing streets. Hmmmm, I could have waited till today, it looks much better, sun is shining, temps should stay above zero, so why did I tortue myself by going out yesterday? Totally uncomprehensible, but I wanted it done, and be free of it today and as I am stubborn,...........well, you know ROFL. All ended well, I didn;t fell, got the things needed, and got some fresh air as an extra. That's about all to tell for today, not much hey? But we have days, that there isn;t happening too much, or at least not interesting to mention, so be it. How is Jan doing these days? Well, not a lot of change till now. Perhaps a tiny tiny little bit better, but not good enough. We'll wait till after the weekend, to see if there is some change, otherwise I think he should go back to the doctor, hmmmm, little struggle again, but I will win it! May be one good things, as the weather is changing into better, well, no snow, no freezing Jan could go out for a short walk, I think that it might help a little bit. He needs to get his muscles working again. I better post the freebie now, and then try to start a new kit. I did already, but after some papers done, I looked at it, and it didn;t feel right so removed them again. The curse of a designer ROFL! Kit today is namened "Whenever". Arlene made again some lovely clusters to go with it. Still a bit cold, but sun is shining. It's still a bit cold outside, but today the day started with sunshine, and then all looks better, isn;t it? Monday I was sooo pleased with myself LOL1 No, really , I did all the things I had on my to-do list, isn;t that wonderful? First early morning i called the doctor's office to make an appointment for Jan, and he could go there around 11.00 o'clock same day. Good. As he was there, I rushes into the kitchen to fill a bucket with water and some stuff, rushed back into the room to get me the curtains, and put them into some water to get white again LOL. Then I washed the windows, and did some cleaning and dusting in the room. And oh, so good to hang out the curtains for a moment outside, to drip off and get fresh. HAHAHAHAHAHAHA! Me dummy! Good that after a couple of minutes I just checked if they still were hanging, because when I touched them, I felt that they were already getting stiff, almost frozen! Why don;t I use the brains I got once???? It was still lightly freezing outside!!! I just was in time to save them, and hanged them in the shower room for further dripping off. Pfffffffff, all was well. Also did turn on the washing machine in the meantime. Then I had to go out(Jan was back by that time), to get him his prescription at the drugstore. Doctor didn;t tell what was wrong with his back, probably it was hard for him to dertermine, but for the moment Jan got some painkillers, rather light ones, just paracetamol with codeine, and doctor would ask for the photos that were taken at the hospital. Well, let's see if that will help after a few days. I got back, and despite of his back, Jan already did hang back the curtains in the room, silly guy. And when that all was ready, I thought it was good enough for the day, and sat down with a sandwich. Yesterday I took it a lot more quiet, just went out to get a few groceries, and then did some designing at the computer. I am not sure what I will do today, probably not too much, but if the weather stays the way it looks now, just may be I will go for a short market visit, we could do with a bit of fruit and cheese. Perhaps not the most inspiring blogpost, but wheh I read it back, I feel good about myself, LOL! And may be I made you smile a bit, about my curtain adventures, grin. Before I put on the freebie, I want to draw your attention to Linda's blog, where she has posted again a beautiful quickpage! 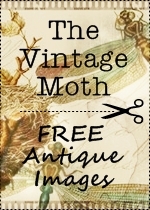 And do you know the Cottage Art blog? 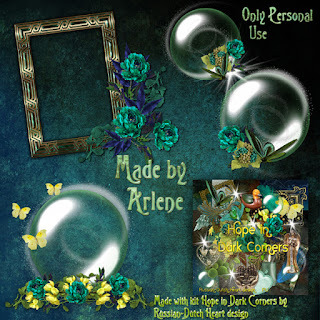 I found that and there are some wonderful tutorials, very well explained, together with screen shots, and some freebies too, and lots of things useful to a scrapper and photographer. Just take a look there. 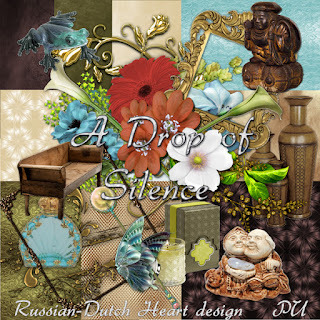 And another one that could be very helpful is The Coffee shop blog. 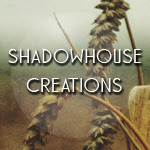 Tutorials, freebies and lots of stuff! 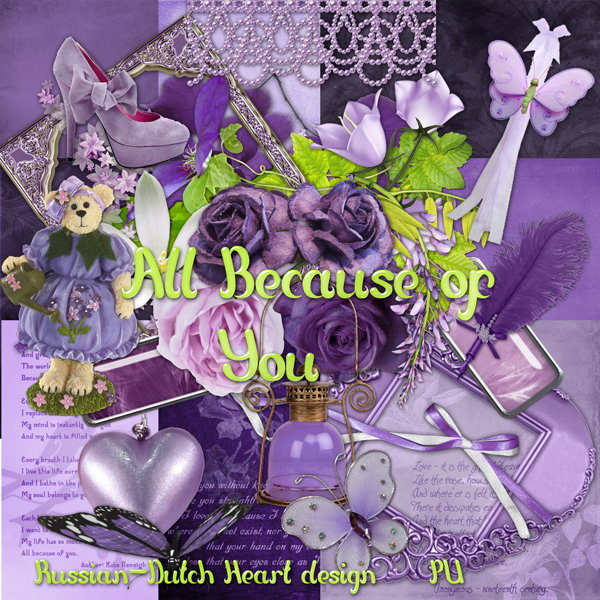 Now here's the freebie for today, "All Because of You". as tomorrow is Valentine's Day I think it is a perfect kit. 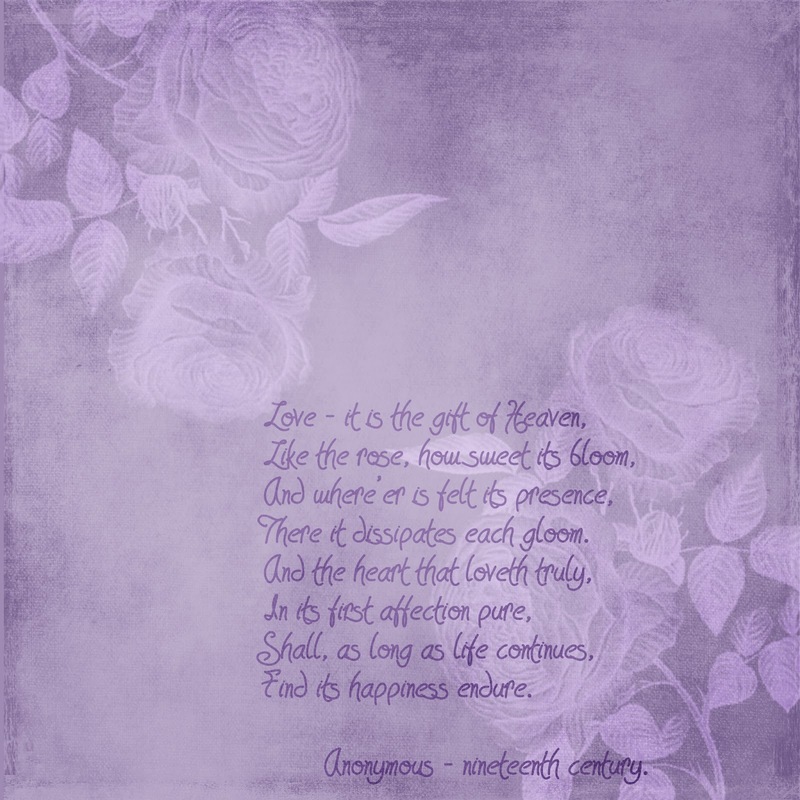 I will show you a preview of one of the papers, I;ve made 3 papers with a love poem on it, yeah. And then with a great photo, one of these papers and a cluster from Arlene, voila, you have a wonderful layout. We had a tiny little bit of snow here, almost not worth mentioning it. No comparison to the mountains of snow coming from Nemo blizzard. Gosh, I hope everybody is okay, living in that area, without too much trouble of it. This morning I made an appointment for Jan with our doctor, it's just across the street. I so hope, he will have a solution for Jan's back trouble, it is about time that goes away. Well, cross fingers I should say. Saturday I went to Séverine's birthday party, and it was nice to see her. She's a lovely girl, and as I was early I even had a few moments to talk to her. She is becoming a dangerous girl though LOL! She is doing judo and just the other week she did another exam and has now the green belt. So boys will have to be carefull with her, because she can handle them! I think I stayed there for about 1 1/2 hour and thought it was good enough. By that time all the family was there. On the way back home I quickly did some shopping, nothing much, just for dinner. I bought us a smoked sausage, and we had still a peasoup, so I cut up the sausage and put it in the soup and it was a hearty meal and quick too! On Friday and Saturday we always have a bit of fantasy dinner, something quick and easy, I think it's enough when I cook the other 5 days, isn;t it? Just don;t know if I will go out today or tomorrow for a few groceries. Although no snow, it's rather cold outside, mainly because of the wind. Perhaps I stay in today, and produce a bit of activity again in the house. Floor needs a touch of vacuum cleaning desparately, still have to wash the curtains and I think the washing machine is loaded too. Have to put on the meat for dinner, it has to simmer for a couple of hours, to be tender, so enough things to do. Read a very amusing thing on text tv. Two police officers were called that a burglar was active. So they went to the place and the burglar was hiding behind some containers in the street. One of the policemen order him to come out, if not, he would send the police dog to him. Burglat didn;t react, so policeman number 2 started barking( you guessed, they didn;'t have a dog with them) and oh miracle, the burglar came out with his hand high and they coul darest them without problem. Now that I call inventive police work ROFL! 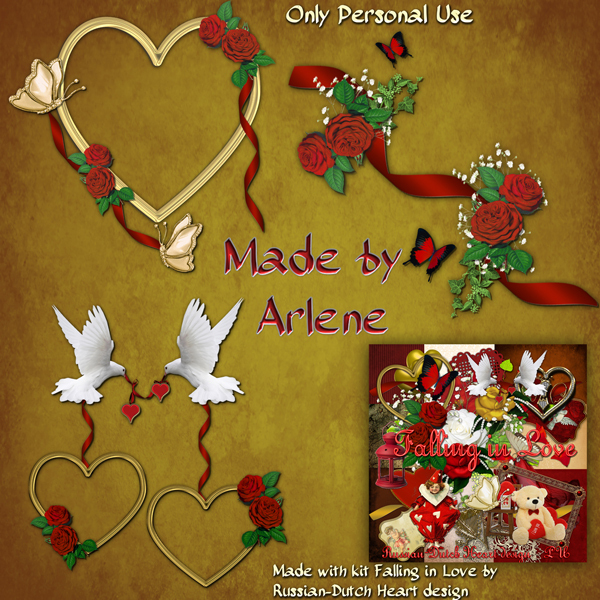 Time to finish this post, have a nice kit for you, "Falling in Love", with Arlene's clusters. Yes, in a few days there will be Valentine's day again, so it is the right time for the kit. Have a wonderful day, people in the snow from Nemo, take care and stay safe! So early morning already so persistant. Still not all too bad weather around here, although the "feeling"temperature isn;t real nice. Much colder, because of the wind( we have lots of wind at the coast), but it looks as if today there is much less of it. Well, it doesn;t matter really, cause I have no plans going out today, no need for it. Yesterday we got aletter in the mail, with the announcement that a neighbour passed away. It was a nice older lady, that I talked to from time to time if met saw eachother leaving the house or going out. We had a little bit more contact the last two years, we had a key to her house, cause she was disabled and if she needed help she could call us. Last year she fell, broke her wrist and hip, so had to go into a home for rehab, but slowly she got worse abd then there was the bad news, she had blood cancer. With all her other diseases(e.g. bad heart function, as one of it) we could expect this news . Depite of her physical troubles, she stayed somehow optimistic and was full of life. Still it shocks you when you get the news of someone passing away, even if you don;t know that person really well. I hope she is in peace now and without any pain and trouble. Yesterday I went further away for some shopping, I took the tram, to go to the cheaper supermarket( just cheap for certain things, if you look well at the prices LOL), but it was worthwhile the trip. Got me several things they don;t have at our supermarket, or if they do have them, they are much more expenseive. As I woke up pretty early today, I was already busy soon after my coffee at the phone. Jan is still suffering from his back, and I think it is taking too long now, so some action is needed. But as you know by now that my hubbie isn;t a "doctor-walker or caller" LOL, it always takes some time to get trhough to him. As in the last two or three days he has more trouble with it again(perhaps made a wrong move or so but still), I finally took the phoen to call his specialist. Perhaps you still remember that Jan had some photos taken of his back at his last appointment with her. But we still didn;t hear anything about it. So I called to the hospital, and after some persistance, it took some time sigh, I got in touch with her assistant. Pushed a bit and I hope his doctor will call him today. Not that it will help immediately for his back, but he can talk with her at least, and that's already something and hopefully she will have some results from the photos. If not, well, we will see what to do next. It's is so strange, some days it's going really a lot better, and he even was thinking of perhaps being able to go back to work shortly. But no way Jopse, if he is in this shape again. Pfffff, I really hope this will heal soon and be over with. The fluid retention is under cotrol again, I think, and that's already something, but we don;t need another thing popping up. 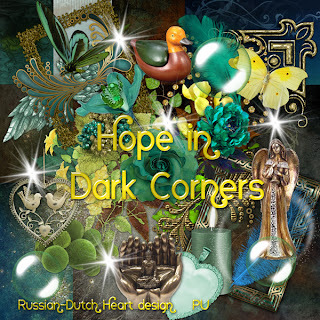 Hmmm, this isn;t a very uplifting blogpost to read, I think. But don;t worry, we are not in a depressed mood all the time LOL!. We still have enough laughs and humor that brighten the day. Tomorrow I will have to go to Severine's birthday party for the "older people", hahaha, but I think that I will do that on my own. I probably will not stay too long. On those days Heidi is too busy to have a good chat with, so I will give the girl her present, stay there for a little while, taking a cup of coffee being nice to the family(never know really what to talk about, I know them of course a little bit, but in fact we have no real connection, know what I mean?) and then off I go again. May be next week there is a moment to visit Heidi and have a chat just together. Although in the weekend we are pretty good supplied on tv with nice things to watch, it happens during the week there isn;t much on tv. But this week I took care of that LOL. I stumbled upon a great dvd for only a few euro's, from a really good series about the Italian maffia. We already saw earlier series of it on tv, but his one is new to us. So we have now 10 hours of crime to watch ROFL. It's called "The Octopus"and I believe they are in the 10th serie of it already. 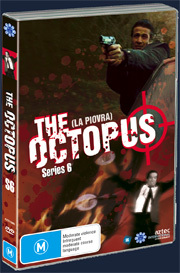 The Octopus –an everyday tale of power, corruption and the Mafia– remains one of Italian television's most enduringly successful ventures.First broadcast in Italy in 1984, The Octopus (La Piovra) is an international blockbuster, running 18 years and producing nine follow-up series. The title of this classic Mafia thriller says it all, evoking the image of a secret criminal culture extending its tentacles into every layer of society. Ultimately shot on three continents, The Octopus brings scope and sophistication to the story of an old battle and shows the cost men and women pay when they stand up to the injustice of organized crime. Police Detective Davide Licata is shot by a mafia hitman, he survives and after months of recovery he joins the anti mafia group Nucleo,(a secret service built to do the dirty crime fighting jobs that the police cant do). His first mission is to find Tano Carridi, the master mind of the mafia. For the first time, the scene of action moves from ITaly to Eastern Europe where Licata investigates and severs the alliance between Mafia clans and ex KGB undercover agents. So I think it's time for the freebie now. The kit named "A Drop of Silence"( and sometimes we can do with a bit of silence, oh that can be sooooo good LOL) and some clusters from Arlene, naturally. Have a wonderful weeked, have fun, but also try to relax, next week we will need all the energy again ! Remembering from looooong ago ! Today looks okay to go out. Oh, I went out yesterday, but it wasn;t nice at all. It even felt colder, and much more unpleasant than a couple of weeks ago when we had frost! There was again some snowfall, most of it in the eastern part of the country. I don;t see any out of my window, hoorray! 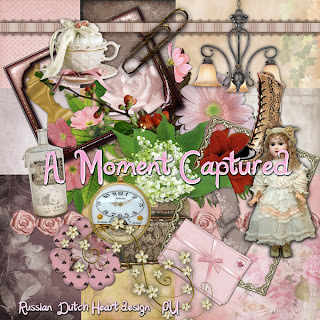 I just came from Miss Edna's blog and her blogtitle brought back some memories, from looong ago. Her title was "My First Kiss", but it wasn;t about her first kiss with a boy, but the first "kiss"she received from Pogo LOL. But I can imagine she was happy about it, it shows how much Pogo is feeling at home and is happy with her taking care of him! Still, it made me think of my first kiss. Well, that was a long time ago. I think Had 15 or 16 yeast, rather "old"perhaps for a first kiss, but it were different times then. I remember there was a little party, I think it was even at high school, and I had no boyfriend to go with. But.... my good girlfriend at the time had a solution. She new a boy, I think it was a friend of her boyfriend, and she would ask him if he wanted to go with me to that party. Blind date stuff. He did agree, so I was all nervous by the time he would come to my house. I opened the door and there was standing a not so bad looking tall boy. 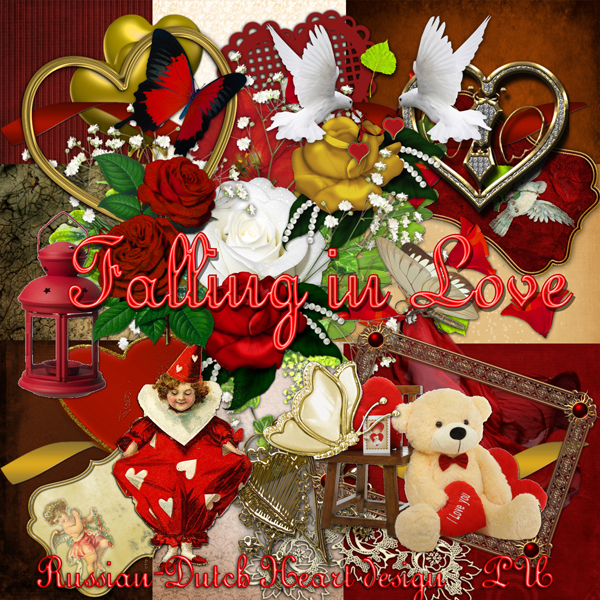 Okay, after a bit of talking we went to the party and yes, we fell "in love"and I received my first real kiss. He was a nice boy, with a good heart, very helpfull, with thank God also some humor. But our relationship didn;t last for long, just about 2 1/2 months LOL! I fell in love with someone else and I broke up our "relationship", it took place just around the corner of our house at that time, I even gave him back the ring he had given me(yes, I received a "friendship"ring from him, whoopee!). He was even crying when I told him I met someone else, who took the place in my heart. Oh, poor guy. But.... I still have the little single he gave me, with "our"song on it, "The First of May" by the Bee Gees!! Romantic isn;t it! On that song we danced our "slow dance"and gave eachother the first kiss. 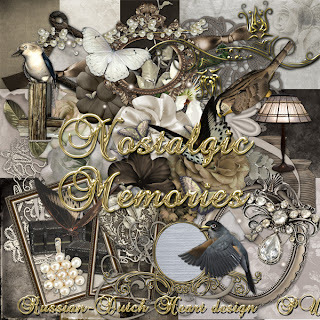 Ahhh, memories are such nice things to have. Okay, back to present life again! With even some sunshine at the moment I shouldn't wait too long to go out, because you never know with the weather here. It can quickly change into much more unpleasant stuff. With those memories popping up, I think I have a great kit for you, named "Nostalgic Memories". 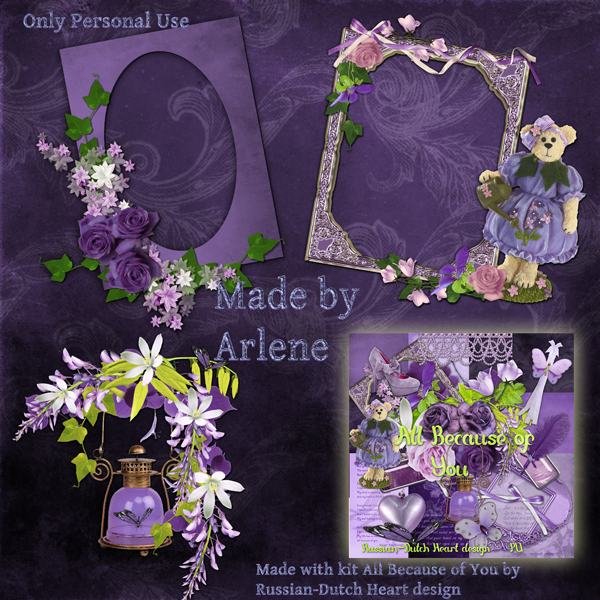 Some great clusters from Arlene and I am sure you can make some beautiful pages of moments, you really don;t want to forget. Which bank is to trust? In the last couple of years quit some banks got baknkruped, or have been taken over by the government. Those banks are having a great deal of the blame of the crisis we are suffering now. Just last week another bank has been taken over by our government, and a part of the big money has been suplied by other banks. Imagine, the bank I am talking about, had 3 division, the Banking, other division of mortgages and one handling real eastate. Well, that last part has done bad, very bad, mostly because the direction invested in bad building projects. So in a hurry the Dutch state had to interfere, to keep the bak alive. But who is in the end paying for it all? Yes, the tax payers, and that's us! It is unbelievable that those things can happen. It is said by our minister of finance, that this will cost "us"money, but that is was no option to just let that bank "fall over", because that would even cost a lot more money. Well, I wonder. I am telling this in very simple words, it is much more complicated, but this is what happened the last couple of days. But it is unbelievable what guys im high positions, who earn real big money, can do for their own gain, without being procecuted. Oh, there will be an investigation, of course, but I am sure in the end the guys responsible for it, will walk away practically unharmed and mark my words, in a few years they will have another great job, with immense salary, and bonusses. So frustrating when you hear that! Okay, enough grumbling for a Monday morning LOL! 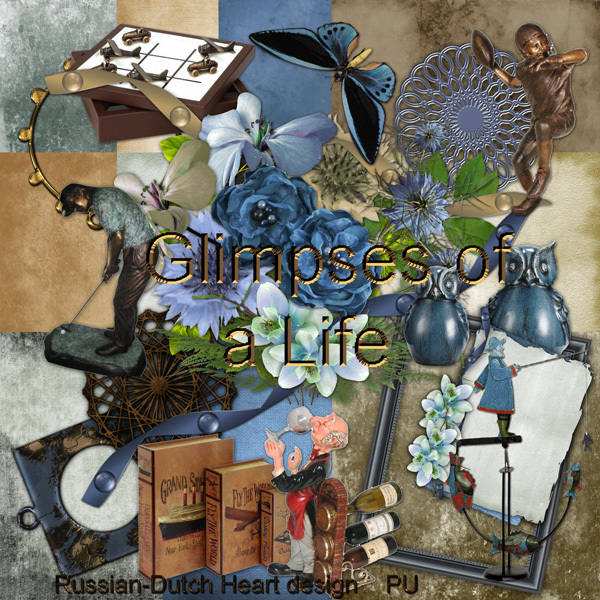 It was a nice, quiet weekend, and I did a lot of designing, although I didn;t got to another bloglayout yet. Well, that will be done one of these days. I will have to leave the computer a bit alone today, some serious celaning is waiting for me. I think the toilet/bathroom has need of some refreshing, and if time is left(and spirit in me) I might wash the curtains of the front window, they look a bit weird, grin grin. The weather here is not all to bright, in the weekend there was quit some rain and also fierce wind, temps are a few degress above zero, but it's not nice. Topday is about the same concept, so I think I will stay in. Well, I have all I need in the house, only somewhere this week I might have to go to town centre, to find a present for Séverine, Heidi's daughter, who has her birthday this week. I asked Heidi if the girl had some wished, and she liked to have some books of a certain writer, it;s a whole serie, and she seems to like it. May be I will find it, on the other hand it's a bit difficult, if she asked it sevral people, easily she will receive "doubles". May be I will give her just a little amount of money, so she can pick them out herself. In general, I don;t like giving money as a birthday present, but sometimes it's more pratical. Oh my, decisions, decisions to make, LOL. 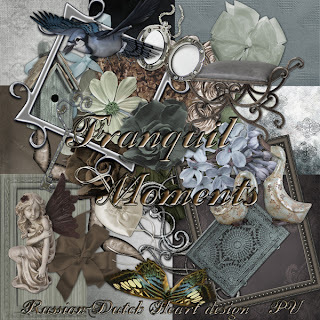 Okay, I have just a bit of time left to take another coffee, may just half an hour to design a bit, and then I want to get started with the cleaning. Sigh! Okay, if I do it quick enough, I might have some time left this afternoon to play on the computer. 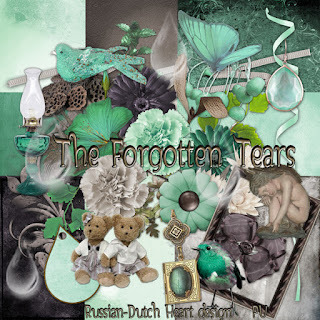 For now I will say"goodbye"not without leaving you with a freebie of course. It's'a bit Vintage looking kit, named "A Moment Captured", with Arlene's clusters. 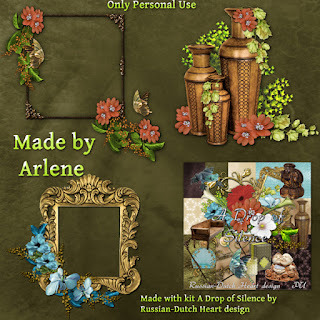 Just got a mail from Arlene, with some new clusters too. She is catching up on life again, just got rid of all Christmas stuff and started to do the cleaning. She still is suffering a bit from the flu,so has difficulties to sleep well, because of the coughing. May be it will get better now that she her life is getting into "normal" gear. I don;t have too much to talk about today. 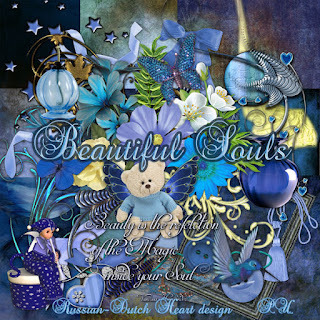 I want to finish one or two kits this weekend, want to make me a new bloglayout too and have to make a page for a project for Minky, I think a lot of you received an email about it. 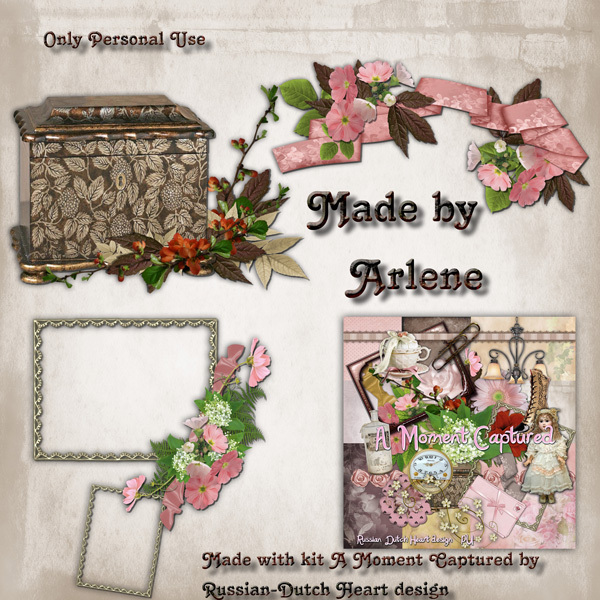 What a good idea to make a "Digital Friendship quilt"for her. So you see, lots of projects in mind. Some great tv programs too to watch, some of them we will register on the DVD and video. Good for the days there is nothing interesting to watch on tv. Brodski changed his "relax"place again. Now that it's not freezing anymore he's back into the kitchen. Till a few days ago, he was all the time near us, much on the couch and so, but suddenly he just comes to check upon us two or three times in the evening, but only for a moment and returns then to the kitchen. Cats are and always be strange creatures LOL! Okay, I will finish now, not leaving you without a freebie. 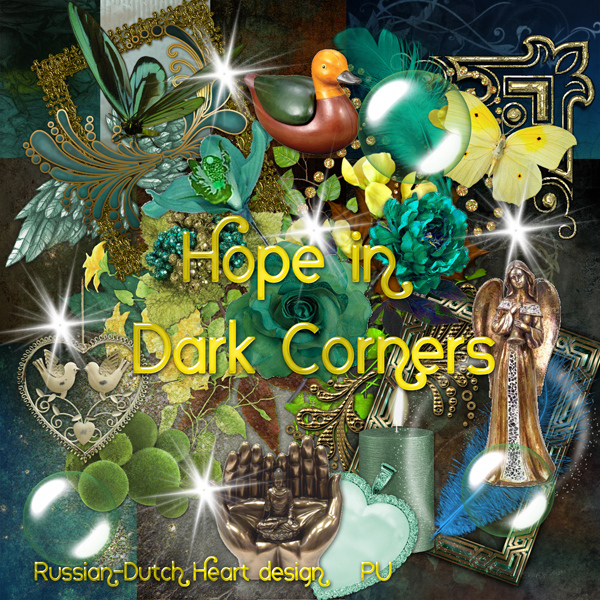 I will give you the "Hope in Dark Corners kit"that's the one I've made the layout with Pogo last week. Have an awesome weekend, stay healthy, see you Monday again.